While battleship designers had long tried to protect against underwater attack, the first months of World War One showed the full extent of the threat posed by torpedoes and mines. The existing underwater protection systems installed in pre-dreadnoughts proved totally inadequate, and numerous vessels were lost to these causes. Even the dreadnoughts were not immune, as shown most notably by the loss of Audacious in the first months of the war. 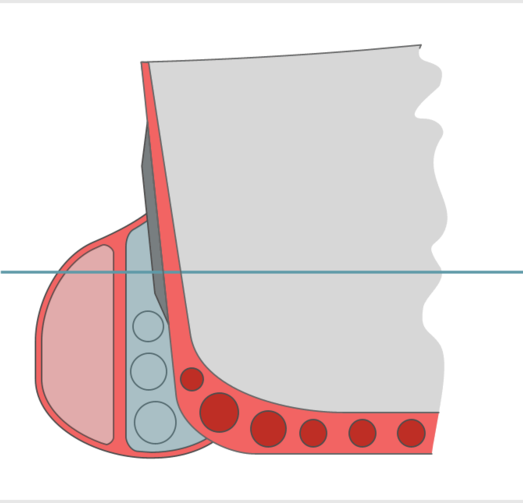 The British quickly began to look for ways to improve protection, finding one in the form of the bulge. In their simplest form, these were simply expansion chambers mounted on the outside of an existing hull, with a free-flooding liquid layer behind the air chamber. This increased the depth of the TDS, and provided an effective air-liquid layer system. Bulges were first used on ships operating close inshore, a particularly good area for submarines and small torpedo craft, and proved very successful. Even the earliest bulged ships took torpedo hits with no damage. The only drawback was a slight reduction in speed,1 and even battleships were soon being fitted with bulges. Ramillies and later capital ships were fitted with them while under construction, while other ships gained them in refits. As if the TDS designer's task was not hard enough, people were inventing new ways to attack ships underwater as early as 1911. The first effort was the Davis Gun, an 8" recoilless weapon intended to fire an HE shell through the side of the ship. This would totally defeat existing systems, and both the USN and RN looked at fitting underwater armor. They soon determined that this would compromise the effectiveness of the TDS against torpedoes, due to the fragments produced by the inflexible armor, and that the Davis Gun was not particularly effective. The threat reappeared during the interwar era in a slightly different form. Designers had assumed that any shell which hit the water would be either deflected upward or quickly stopped before it got deep below the waterline. Until the great increase in combat ranges during WWI, this had been a perfectly valid assumption, but the steeply-falling shells of long-range battle could penetrate deep below the surface of the water before losing speed or going off. This raised the specter of shells falling short of the ship and penetrating through the unarmored TDS deep into the bowels of the target. Only the Japanese made a sustained attempt to exploit this mechanism,4 but designers the world over had to take steps to protect against it. The first generation of treaty designs were largely too tight to do much about this. 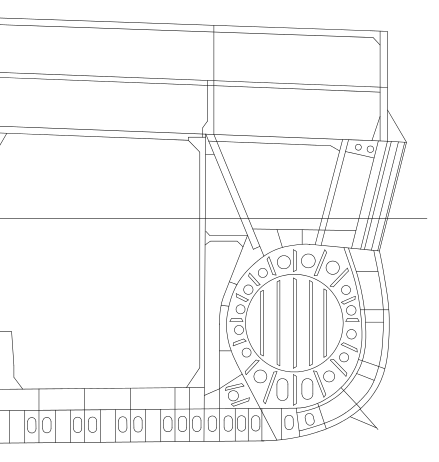 The North Carolina class were fitted with armored patches over their magazines, but the follow-on South Dakota and Iowa classes had their angled armored belts extended down to the bottom of the ship, forming the third bulkhead of the TDS. 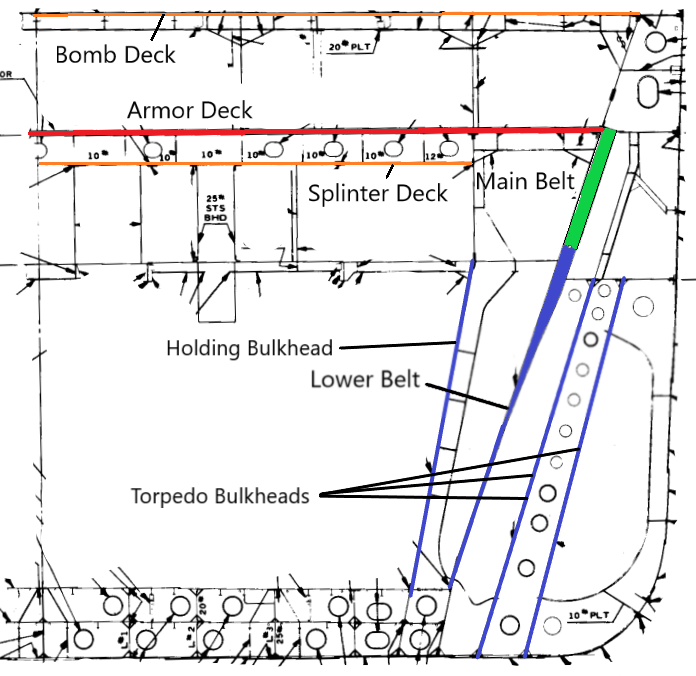 This also meant that the armored deck and belt didn't threaten to trap the gas jet inside the vessel, a serious problem on the King George V class. The urgency of the situation meant that the American ships were laid down before the systems could be tested in full scale, and the tests were a rude surprise, with the rigidity of the armor proving a dangerous weakness. The initial plan for the 4-void system had been a traditional void-liquid-liquid-void, but it was changed to liquid-liquid-void-void when tests showed that that arrangement would be more effective. Further tests showed that there were structural weaknesses in the system for the Iowas, and BB-65 and BB-66 would have had a modified system, estimated to be 20% more effective, had they been completed. The Japanese went even further, giving equal weight to underwater shell hits and torpedoes. For reasons that are not entirely clear, they ignored the use of liquid layers entirely, apparently believing that the thick lower belt was adequate compensation. 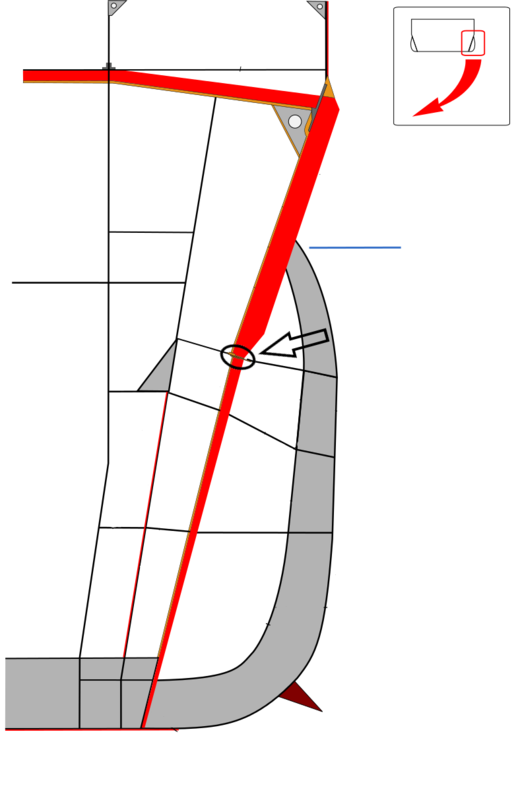 This was not the case, and to make matters worse, the joint between the upper and lower belts was designed improperly, with incorrect scaling from the model tests. It relied entirely on the shear strength of rivets, which failed under relatively light torpedo hits on Yamato, Musashi and Shinano, ultimately leading to the loss of all three ships. An innovative attempt to reduce the size and weight of TDSs was the Italian Puligese system. The lower corner of the hull was filled with liquid, either water or oil, and an air-filled cylinder was placed in the center of it. In theory, the cylinder would collapse under explosive loading, the sudden increase in available volume robbing the gas jet of its energy. 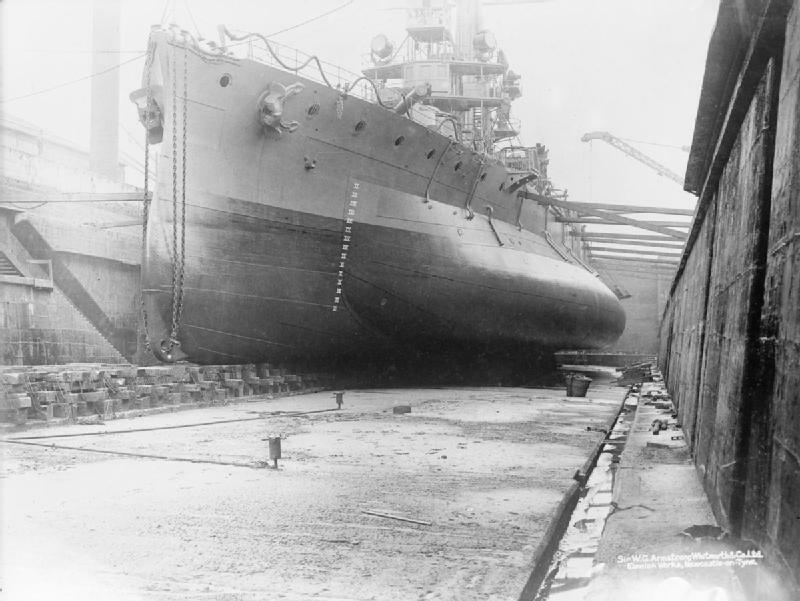 The holding bulkhead surrounding the liquid had to be strong enough to withstand the pressure until the cylinder collapsed, which was the problem with the system as implemented on the Italian Vittorio Veneto class. The riveted joint at the bottom of the bulkhead was not strong enough, and tended to fail before the cylinder collapsed, causing extensive flooding. It was also very difficult to build and repair, due to the complex curves involved. The last of the treaty battleships, the French Richelieu class, had a very effective TDS of their own, deep and of largely conventional design, with an interesting twist. 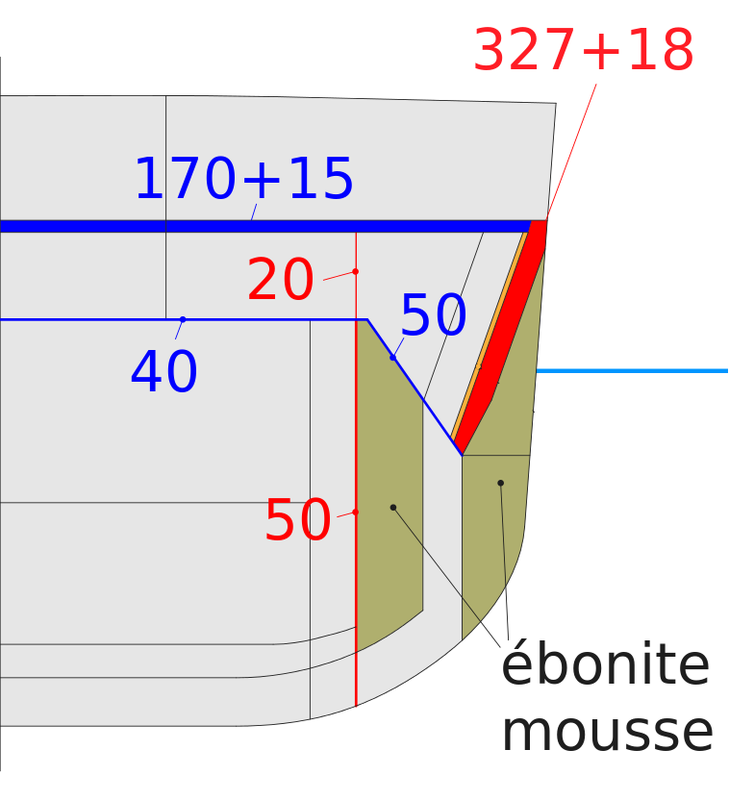 A material called Ebonite Mousse was installed in some of the void spaces. This was the last in a long line of attempts to use something that would prevent flooding into void spaces when the system was damaged. Most early attempts had failed, notably the use of wood pulp, which rotted. However, the Ebonite Mousse, a gum rubber foam, was a success, requiring little maintenance and proving effective in tests. All of these systems suffered from insufficient depth near the ends. In fast battleships, which all of the treaty ships apart from the Nelsons were, the need for fine ends to achieve speed conflicted with the need for deep TDS. Even the best TDS was of no use against torpedoes that did not hit it, and it proved totally impossible to protect the shafts and rudder. A hit in this location ultimately doomed Bismarck, and constituted a serious vulnerability in all ships. Another threat that a TDS could not counter was the threat of an attack from underneath. For many years, this was not a serious problem, but it became a concern during the runup to World War II. I'll talk about it in more detail down the road. 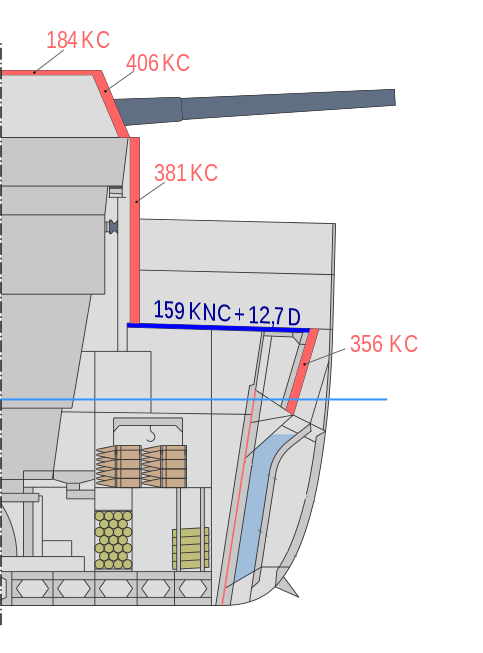 A lot of diagrams and plans I've seen seem to assume that "waterline" is a constant level along the side of the ship. Yet in high seas, or during high-speed turning maneuvers, wouldn't there be a substantial difference in what was and wasn't exposed to air? How did naval designers allow for that effect? Usually, that was dealt with by making sure that the belt went below the waterline. I'm not sure what torpedoes did in rough seas, but they're heavy enough to not be able to run up and down easily. They probably track fairly close to their average depth. I do know that on a few ships (I believe it was the North Carolina) some of the armor was tailored for the waterline as the ship was moving instead of assuming a stationary ship. But it's been a while since I looked into that.